Time for the day job. My role as Oracle Alliance Director for UK includes ensuring that our partnership status is in place. So I was so pleased that immediately before OOW we heard our bid for Diamond Status was successful. Fujitsu designs, builds and runs IT systems. As part of that we have an alliance with many vendors and in the UK & Ireland I look after the alliance with Oracle. When Oracle announced their Specialization Partner Program in 2009, our immediate aim was to convert our top level Certified Advantage Partner to the equivalent Platinum partner Level. Oracle granted CAP partners 12 months grace to achieve the 5 Specializations required. Everyone in the Fujitsu UK Oracle prcatice is encouraged though the appraisal process to achieve the competency testing and where appropriate, specialist for their area. We therefore quickly adapted to the new process and achieved Platinum . 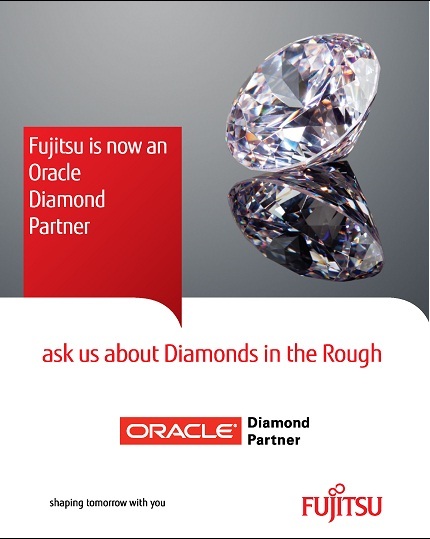 Then Oracle raised the bar further and introduced Diamond Level, for their global partners. This requires much more commitment and it is expected that there will be no more than about 10 -15 partners globally. First we needed 20 specializations including 5 at advanced level where you need 50+ specialists. These specialists are testing externally and the level is very high, for example a DBA specialist needs to be Oracle Certified Professional. I want to use this blog to thank all of those who took exams especially those in the beta programs where the waiting was so long. Fujitsu plays into the Oracle full stack really well, although often independent there are allainces at very level. Our strategic alliance around SPARC, through all services and our managed services offerings for applications means we worked diligently through the specializations that reflected these offerings. I have blogged before we started with the technology as we were already known for our hardware and applications portfolio. Fujitsu did not stop once we achieved the prescribed 20 specializations, because as I said it is our culture to encourage this at individual level. In fact at a recent partner showcase I had to accept the smallest possible font on the fixed size poster as we had 26 specializations, but even better it was confirmed at OOW that we had at that time 32 specializations the highest achieved to date by any partner. As well as specializations to achieve Diamond you need a number of approved offerings with oracle. This sounded quite simple, we provide all sorts of Oracle services, however it was a very thorough process requiring lots of sales and marketing artefacts, case studies etc, and Fujitsu has a slightly different go to market model than Oracle so there was quite a lot of work to do. I was responsible for 6 of them, and although our aim of achieving by OOW was very stressful, there were a lot of things I learnt and I look forward to working on new offerings from start to finish, rather than this retrospective exercise. Anyway we achieved it, with the official announcement being made on the Monday of OOW although at OPN day we were listed. Fujitsu is global and I am part of the global team, and this was a real team effort. My counterpart in the US Jere Weliever and our global administer JessikaWeis especially need lots of credit. Valuable for me.. Is there any further reading you would recommend on this?